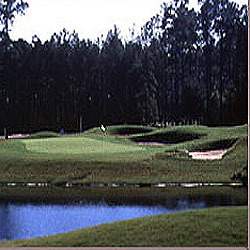 Architect Dennis Griffiths designed this track as a finesse course. He did not produce the typical beach layout when he created this 18-hole design, built in 1988. It has narrow bermuda grass fairways and large bentgrass greens and is bordered on the east by the Intracoastal Waterway. Holes No. 1 through 15 are short, and the course lulls you up to this point. The last three holes are uncharacteristically difficult. The course is mostly flat, with occasional uneven lies. Some tree-lined fairways have doglegs. The course is always fun to play and an especially fun round of golf for couples.